The newly sworn-in Lagos State Governor, Mr Akinwunmi Ambode, says he will establish a new Ministry of Wealth Creation and Employment, as part of his administration’s reforms. Delivering his inaugural speech on Friday, the Governor said the new ministry would specifically address the promise he made during the campaign on employment trust fund, labour exchange and entrepreneurship. “This goal, we shall pursue vigorously,” he said. Mr Ambode further stated that a new office of Overseas Affairs and Investment (LAGOS GLOBAL) would be created under the Governor’s Office while the Office of Civic Engagement would be created under the Deputy Governor’s Office to strengthen and enhance a government of inclusion, saying “everyone must have a voice in my administration”. 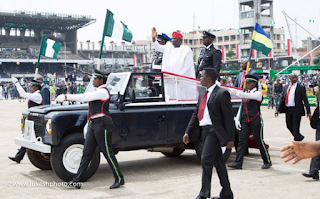 The Governor of Nigeria’s commercial city told the crowd that witnessed the handover ceremony that he would embark on continuous reforms in the public service. “I am determined to demonstrate that the government belongs to the citizens. You have put us here as servants to serve you and not you serving us. Today we are committed to that creed. “Moving forward, the Civil Service will be strengthened and made to respond to the needs of all citizens in the same manner that quality services are rendered in the private sector. “My administration is prepared to take the decisions needed to promote merit and professionalism. To restructure where required, eliminate poor Human Resource practices and accelerate the pace of reforms in the spirit of good governance,” The governor said. He assured the business community and corporate Lagos that the ease of doing business in Lagos would be improved upon earnestly, stressing that Lagos is open for greater business. Mr Ambode said: “We want you to fly into Lagos, start your business, find your way; live, work and enjoy in Lagos”. On the development of the state, he stressed that he was committed to the State Development Plan (2012 – 2025). The plan is structured under four pillars; (1) Social Development and Security; (2) Infrastructural Development; (3) Economic Development and (4) Sustainable Environment. The Governor also pointed out that the challenges facing the state were good enough ingredients to bring out the best in his administration. “Together, we shall push forward and not look back, with our hands firmly on the plough. We would work hard to tackle poverty, ignorance and social decadence in our State,” he said.